What Are The Benefits Of Adjustable Standing Desks Made In America? ← When Should you Consider Office Chair Replacement? By definition, an adjustable standing desk, also known as a stand-up desk, is a desk that can be adjusted in height so that you can alternate between sitting and standing. They are also referred to as sit-stand desks or height-adjustable desks and they offer you the option to either stand or sit comfortably as well as move around freely while working. As someone who works in a typical office setting, you know how long workers can spend their day in their chairs to get through the day’s work. One study has shown that desk-based workers spend an average of about three-quarters of their day sitting down to do work, with the remaining time spent walking, standing, or doing tasks that were physically demanding. Employees reported a desire to decrease the amount of their work time they spent sitting down to about half their workday and increase their time being more physically active. This reflects a lot of what office workers feel everywhere. Adjustable standing desks are becoming gradually more popular as an ergonomic solution to the typical office worker’s desire to be more active while relieving the physical stresses that an average workday at the office can put on the body. Making the decision to provide adjustable standing desks in the workplace promotes many impressive health benefits, not the least of which is long-term back pain. In fact, back pain tends to be the most common grievance among office workers who spend virtually their entire day sitting down. Research has proven results of up to 32% improvement in chronic lower back pain among participants. Also, findings published by the Center for Disease Control, CDC, show that working at an adjustable standing desk as opposed to a sit-down desk can reduce neck and upper back pain by as much as 54% in just one month’s time. And not only that, but participants reverting back to the sit-down desks actually found many of these improvements reversed within a period of only 2 weeks. So we all know that sitting for long periods of time over the course of a workday has been scientifically proven to be detrimental to our general health and well-being. Some of the negative effects include weight gain, obesity, diabetes, heart disease, and even unnecessarily early death. On the other hand, the use of adjustable standing desks offers not only more freedom of movement for a more energized, creative and productive work staff but can also help to improve and even negate the harmful effects of prolonged sitting over the course of the workday. With the link between a more sedentary lifestyle and increased depression and anxiety, and with the importance of employee morale in the office setting, adjustable standing desks are an excellent way boost the mood and energy levels. One week-long study found that a vast majority—over 80%–of workers who used standing desks reported increased energy and vigor as they moved through their workday. Surprisingly, while we think of sitting to be more relaxing than standing and walking through the course of the day, workers actually reported a decrease in stress and fatigue over the week they used standing desks. 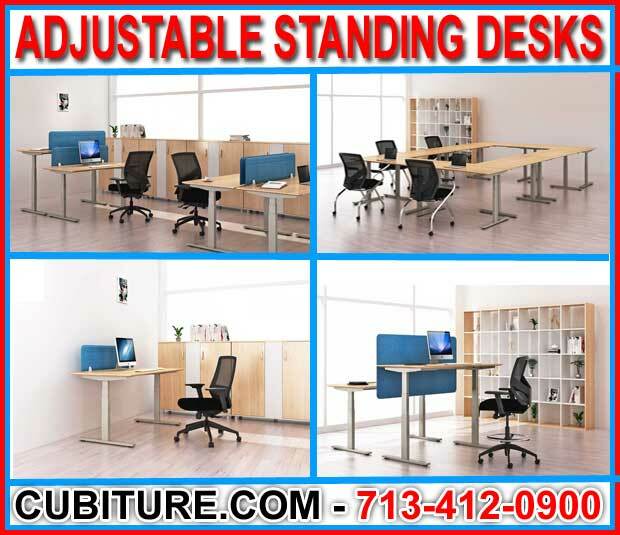 Productivity within the workplace also increases significantly with the adjustable standing desk. These desks showed no hindrances to daily office tasks such as typing, even when standing at their desks for four hours each day. It’s even possible for a standing desk to improve productivity over the long run. Adjustable standing desks also offer employees the ability to customize their work routines to their personal needs in such a way that isn’t possible with traditional desks. With a sit-down desk, you only get the option to stay seated even when you’d rather not. But include the right chair with a standing desk and you get a more responsive workstation for those times that you’d like to get off your feet while working. With the office staff having the option as to whether to sit or stand, this induces a more free-flowing, creative, and collaborative working environment.